Nestled on a side street in Los Angeles, this shop is an evolving project. It used to be a family candy shop, well stocked with old time favorites. When I first walked in I heard the proprietor Jonathan Graham, who gets to bill himself as the country's youngest chocolatier at age 22, telling his friends a story about his latest creation. He had just experienced Mango Saffron ice cream and liked the flavor so much he came home and made a chocolate with the same flavors. I tried it later. It is a good first stab, but I hope he keeps working on it. I also learned that he abandoned a Jalapeno-Honeydew flavor that LA critics called too sweet. I wish he hadn't because I would have liked to have tried it. I know it sounds weird, but there is a Lemon Basil truffle in Vancouver (Chocolate Arts) that I adore. Recchiuti makes a Tarragon Grapefruit that has gotten national acclaim. You never know where they next great new flavor combination is coming from. I'll bet some come from this shop. I include the picture of the outside of the shop here, but be sure and take the address if you go. Jonathan has plans to spiff up the joint. He hopes to create a social space on the patio and have parties in the evenings. 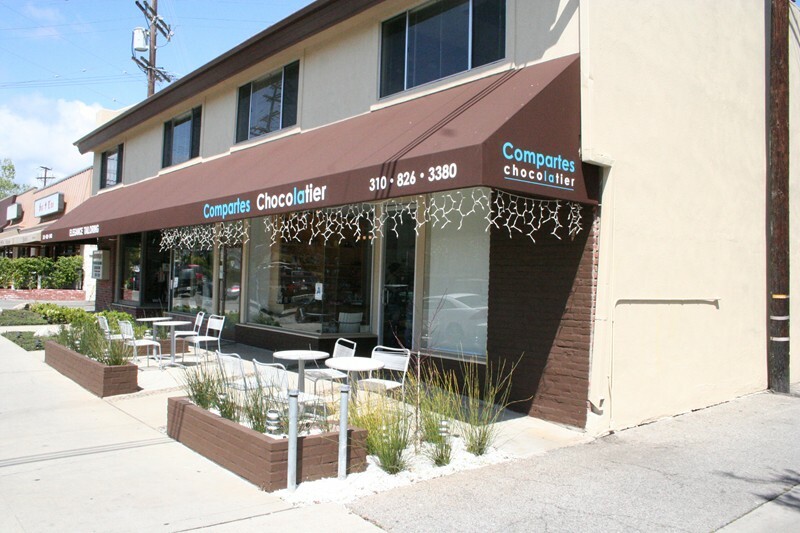 Moonstruck and Ethel M have chocolate cafes now. Belvedere in Boulder has teamed up with a winery to host wine tastings in its shop. (A recent Friday night showed more drinkers than chocolate nibblers.) Jin Patisserie is more famous for pastries and its Tea Garden. I suspect more and more chocolate shops will combine with other concepts to enhance the experience (and increase sales possibilities). Later in my Compartes visit a couple came in that had just visited Jin Patisserie. They mentioned what a chocolate letdown their display was. At Jin there is a very, very small case of chocolates, plus the pastry case. 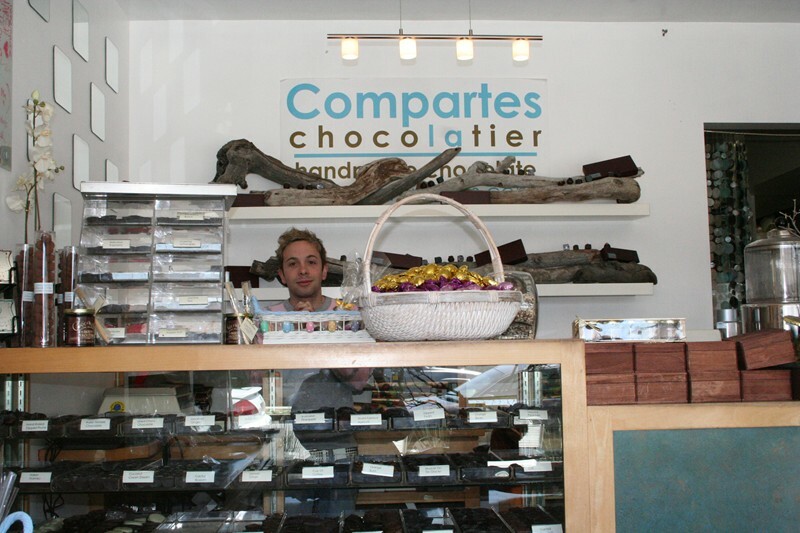 They were awed by the visual impact of the chocolate at Compartes. At Compartes there was a whole wall of seasonal goodies (Easter), and another wall of chocolate covered nuts and assorted other bagged goodies. Then there was the case of chocolates you can almost see in the picture (click on it for a larger version). Prior to this I had not thought much about the visual impact of a chocolate shop. Fran's flagship store in Bellevue, Washington and the various Bernard C shops are all artistic and elegant. Fran's in particular has a warm magic that makes we want to come back just to sit in the shop. See's has a very crisp, clean, black and white appearance that just feels homey and inviting. All of these shops have long, bar-type displays that you can walk back and forth in front of and just bask in the glory of chocolate and the variety of tasting possibilities. At See's they actually have a wide variety of boxed items that wrap the walls of the store so that you are surrounded by nuts, candy, and chocolate there. Compartes is going to change, but for now it is wall-to-wall chocolate and a very rich visual chocolate experience. One special side note: Jonathan's family tree includes the Bonny Doone winemakers. He is always trying new things with wine and chocolate. Once he had a rare wine in one of his truffles. Chefs and wine lovers were coming in for the truffle, just so they could taste the wine. Be sure and ask what is new in the wine and truffle department. Price: It was about $30 a pound for the fancy stuff when I was there (early 2006), but price changes were coming as the line got developed. 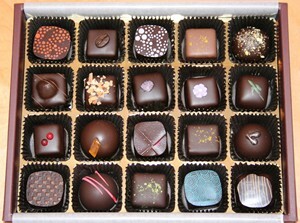 Pieces: Varies, but the picture shows 20 in about a one-pound box. 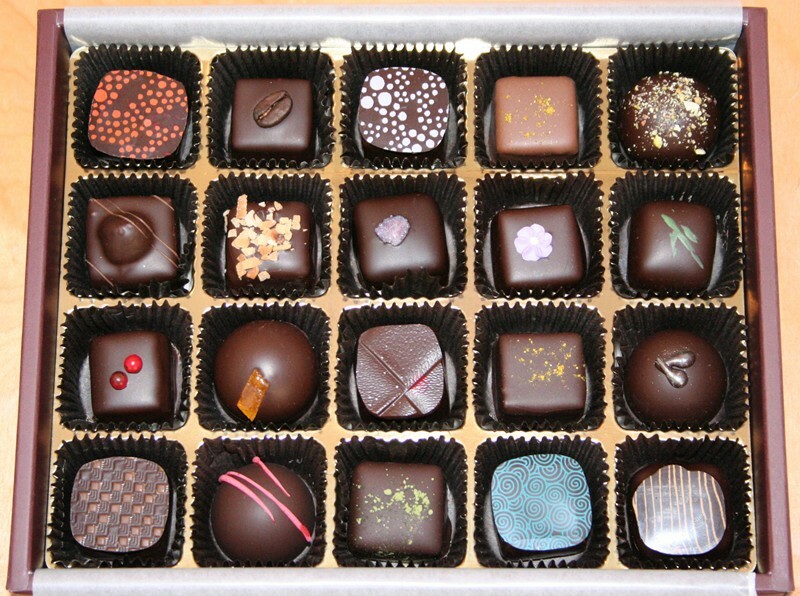 Product Line: New dark chocolate explorations, old time candy shop favorites, and hand-dipped fresh or glacé fruits. I have only been here once, so I can't really have a favorite. What I really liked was the exploration. If you go ask to try what is new and then try what they think is their best creation so far.